You are looking at a very detailed, aluminum, flush-riveted replica of the panel shown in the black and white photo of President George H.W. Bush. Hand crafted from sheet aluminum and period correct aircraft gauges and other cockpit parts. 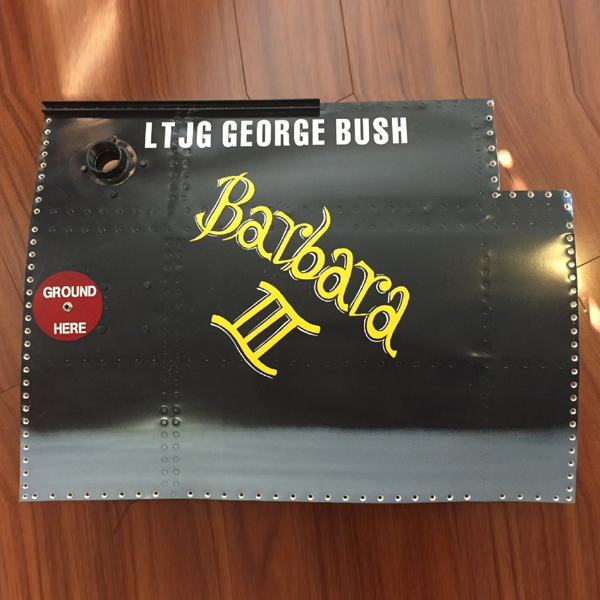 From research of the black and white photo as well as visiting a TBF Avenger in Chino, California, I came up with the information to build this tribute piece to President Bush. Perfect for a Museum, Art gallery, Aircraft Themed Restaurant or the Office of someone who is a fan of President George H.W. Bush or World War Two Warbirds in general. This is a one of a kind replica panel. there is no other panel like it in the world. The panel was made for the President George H.W. Bush Presidential Library, but plans for an exhibit change did not materialize and I am now placing the panel for sale. *******PLEASE NOTE: The small piece that is Green Zinc Chromate primer in color in photograph number 4 is currently painted Deep Sea Blue to match the rest of the panel and was shipped to the President George H.W. Bush Executive Office in February of 2015 with instructions to autograph it and return in the enclosed SASE package. IF this piece is signed (I understand that he is not in good health) It can be riveted to the main panel, and you would have a panel ‘autographed by a president’. Of course there would be additional expense as the value would be increased substantially. I will re-list the panel for an appropriate price, when/if I receive the autographed piece, But if you purchase the panel now, I would make every effort to get you the additional piece at a fair price as well as a way to attach it to the main panel. The additional piece would cost between $1,000.00 and $1,400.00 depending on documentation of the autograph. The Date of Manufacture of this replica panel is the first three and a half weeks of January, 2015. The panel measures 31.6″ long, 24″ tall and 5″ from the wall at the thickest point. The panel is painted the correct Deep Sea Blue color and the bottom is the correct Intermediate Blue color. George H.W. Bush was a Lieutenant Junior Grade at the time he was shot down after a dive bombing mission in Japan, and survived 4 hours in a raft before being rescued by the a US Submarine, Professional Sign Painter, Amber Jeanette painted the yellow and white BARBARA III which of course is in reference to his then-fiance Barbara (Bush) The yellow with white accents is speculation as it’s impossible to tell from a black and white photo, and no experts that I spoke with knew the color for sure. The red and white GROUND HERE is painted in the colors generally agreed upon by the aircraft restorers I spoke to. LT JG George Bush was painted in white as was the tradition in WWII, and represents sometime after the black and white photo was taken when the aircraft assigned to him got a chance to have his rank and name painted. The panel’s interior side features proper lightening holes that make the fuselage Formers lighter and stronger as well as Longerons, painted the proper Green Zinc Chromate aircraft primer color, as well as a Seat Belt Retractor with functioning lever to release the seat belt, and various wiring and hydraulic lines, a switch, etc. I have great feedback from my customers, mainly because these pieces get a lot of attention and tend to create many conversations about military aviation and military pilots. I do this out of respect to those who served in the skies above me. I was a soldier in the US Army in the late 1980’s and early 1990’s and I appreciated when we heard Air Support overhead. BIG TIME! Other panels that I have made are mounted the the walls of restaurants and homes in the USA as well as other countries. I started this business in March of 2014, but there will be a lot more of my work in the future. 22 different types of projects are out there, about 18 of them are listed here on eBay. I do sell a lot of Fighter jet Rank, Name and Call Sign panels for retired military pilots. I’m more than happy to discuss any custom project that you do not see in my store. Thanks for looking at this panel. International Buyers, please contact me to discuss IF I can ship to you and how much extra it will cost. FREE SHIPPING in the Continental United States.